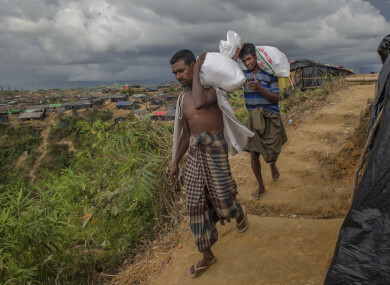 Rohingya Muslims who crossed over from Myanmar into Bangladesh, walk back to their shelters after collecting aid in Taiy Khali refugee camp, Bangladesh,. THE SRI LANKAN government has slammed a group of radical Buddhist monks who attacked Rohingya refugees on the island as “animals”, pledging action against police who failed to protect them. Rajitha Senaratne, a cabinet spokesman, said the government condemned yesterday’s storming of a UN safe house where 31 Rohingya refugees, including 16 children and seven women, had been given shelter. “As a Buddhist I am ashamed at what happened,” Senaratne told reporters. “Mothers carrying very young children were forced out of their safe house which was attacked by a mob led by a handful of monks,” he said. The mob broke down the gates of the multi-storied building near the capital Colombo, smashing windows and furniture as frightened refugees huddled together upstairs. There were no reports of casualties among the refugees, who were later taken to another location, but two police officers were wounded and admitted to hospital. Senaratne said police had been ordered to take disciplinary action against officers found to have failed to control the mob. “This is not what the Buddha taught. We have to show compassion to these refugees. These monks who carried out the attacks are actually not monks, but animals,” he said. Sri Lanka’s extremist Buddhist monks have close links with their ultra-nationalist counterparts in Myanmar. Both have been accused of orchestrating violence against minority Muslims in the two countries. One of the monks who stormed the building posted a video on Facebook filmed by his radical group Sinhale Jathika Balamuluwa (Sinhalese National Force) as he urged others to join him and smash the premises. “These are Rohingya terrorists who killed Buddhist monks in Myanmar,” the monk said in his live commentary, pointing to Rohingya mothers with small children in their arms. They had been living in India for several years before leaving a refugee camp in Tamil Nadu state. The UN High Commissioner for Refugees expressed alarm over the attack and urged Sri Lankans to show empathy for civilians fleeing persecution and violence. Almost half a million Rohingya Muslims have fled Myanmar for Bangladesh since August 25. They have been the target of decades of state-backed persecution and discrimination in the mainly Buddhist country, where many view them as illegal immigrants from Bangladesh. Email “'Animals': Buddhist monks who attacked Rohingya refugees slammed”. Feedback on “'Animals': Buddhist monks who attacked Rohingya refugees slammed”.